"Ericeira was a fantastic place to learn ..."
3 Beach Houses made up of: 2 wooden bungalows, a white house and a spacious common area with BBQ. The Solarium is the right place to relax and tan or just listen to the birds and nature. If you are looking for peace, tranquility and privacy you have come to the right place. Surf is an obvious choice and Foz do Lizandro Beach is the perfect place, only a 1 minutes walk from the house. Paddling in the river, yoga, massage and the jacuzzi are other choices we have waiting for you. Located on Foz do Lizandro Surf beach, the best Surf beach in Ericeira,, you cannot get clser to the surf! Helios is a 25 minute walk from Ericeira old town centre, the 2nd World Surf Reserve, a charming fisherman village. The village has all the facilities you can expect from convenience shops to more specialized boutiques you can find anything easily. Ericeira coast is also famous for the beautiful sunsets all year round. Its a lovely walk to the village along the coast. Ericeira is 35 minutes driving from Lisbon and 25 minutes from Sintra the UNESCO town, a magical place to visit. How were the surf lessons with Na Onda? We had a lovely stay at Helios Ericeira, the accommodation was great and Clara is a wonderful, helpful and a very friendly person. The accommodation is very close to the beach and just a minute away from the Foz do Lizandro beach and the Na Onda surfschool. After a long day in the waves it was amazing to hang out in the lounge area or sit in the jacuzzi with the amazing view of the lovely valley. The beach was a bit windy and the ocean was a bit wild for our daughter of 5 so it was perfect to hang out by the Lizandro river with her. We rented a car at the Lisbon Airport and could park for free just outside at the beach parking lot. You can do without a car since Clara is very helpful but we felt that it was nice to have since it's a couple of kilometers from Ericeira town and the other beaches. The lessons were great, we had a lot of fun. Each lesson was supposed to be 2 hours but was more like 2,5 - 3 hours each time since the guys love the sport and live for it. They were very caring and all the instructors was very good regarding safety and the importance of teaching the basics of surfing before going for the bigger waves and harder conditions. We went to several beaches and they all were great for surfing. When the waves/conditions allowed it, our son of 9 years took lessons as well. They were very good with the kids and the lesson went very well even if our soon only knows limited English. After reading the reviews before our trip we were very excited about visiting Helios and when we arrived it was everything we expected. The house had everything we needed, it was a home from home. Clara was so lovely and welcoming and gave us lots of useful information about Ericeira, which makes a big difference. The hot tub is an added bonus and has a great view! The town has so much to do and see, restaurants were the best and lots of live music and dancing. NaOnda were very good, I had a lesson everyday, we went to different beaches and they really helped improved my skills. We also went paddleboarding which we highly recommend and all the staff were really welcoming and friendly. Excellent accommodation. Clara could not have been more friendly or helpful. The accommodation was fantastic! Clara was the perfect host, it was like staying with family. We stayed in a bungalow, 4 adults, enough room with two of us in bunkbeds (plenty big enough for a good nights rest). The surrounding beach is fantastic, one of the best beaches I've been to, huge, not crowded, family friendly but very easy to find a quiet spot to enjoy the sunshine! The restaurant something "bella" (I can't remember now - but there is only a couple you can't miss it) was FANTASTIC, I had the monkfish kebabs, and the waiter went completely out of his way to make our evening enjoyable. Toasties and coffee from the Na Onda cafe were lovely and again staff were great! Ericeira is a lovely place! 20-25minutes walk from the bungalows, plenty of bars, shops and food stops. You can eat a simple pizza dinner or go more local with the sea food platters or fancy in the quaint picturesque restaurants. You really can't go wrong, everything we had was lovely! Clara often drove us into ericeira on her way home in the evenings and we wandered back later - safe and well lit coast road back. Briefly back to the accommodation. There's plenty of space to relax or socialise depending on your designs. There is a hot tub which catches the sun all day and looks over the green valleys... You can enjoy your own private outdoor patio, with hammock obviously!! Clara will help you out with anything that you need, shopping, local advice, arranging pretty much anything - there are not many people like her in the world!! for the more picky: Sometimes you could hear chatting (on maybe one occasion faint music) from local surf accommodation, I sleep with ear plugs anyway and didn't bother me! 4 adults is fine but I could imagine some people would find it a squeeze, so would be worth booking 2 bungalows if that could bother you. no wifi in the bungalows. But can get it in the communal area. The beach was great, soft yellow sand, huge, not crowded! Busier at weekend but still fine! We surfed for the first time. Joao was our instructor and he was great! His advice was ongoing and individual to the person. He was informative and understanding. Always felt safe. When our beach was on red flag the school took us to a nearby beach to continue with the surf lesson. They could've cancelled the lessons but instead they went out of their way. They were knowledgable about all aspects of the local surfing, the beaches, tides etc etc. Antoni (sorry if spelt incorrectly!) was also brilliant, and kept everyone entertained. We will definitely return and definitely arrange lessons with this school again. My boyfriend and I visited Portugal for the first time in September. We had a fantastic time at Helios! Clara gave us an amazing welcome and was so helpful, taking us into town to get shopping and pointing out good places to eat and explore. She is a wonderful woman if we needed anything all we needed to do was text her. And she even waved us off at the bus station when we were leaving. It really felt like we had found ourselves a holiday Mum. She made us feel very comfortable in Ericeira. The accommodation was exactly what we were looking for: clean, private, close to the beach with beautiful views over farm land and a river right on our back door. well worth renting a paddle board and exploring. On the nights when we were too tired from surfing to eat out, the bungalows had great little kitchens so we could cook our own food and relax in the social area or in the Jacuzzi. We didn't hire a car but it was easy to get around on the surf bus and it only cost 1 euro. It does a circuit of all the beaches and goes through the main town stopping right outside the bungalows. I loved the old town at night , watching the sunset at the fisherman wall then trying all the great seafood restaurants on the windy cobbled streets, all so reasonably priced. I could list many great things about the location, the town, the food, but what really made our stay special was our hostess, Clara, and we definitely want to come back again next year. My boyfriend and I took lessons at Na Onda surf school, it was our first time surfing and we had great fun. The instructors were incredible, really nice guys with a good sense of humor and very experienced. There were some mornings that were a struggle to get motivated for but after the warm up on the beach they really motivated us to get out there. There were some days where the waves were too dangerous for beginners but they took everyone to a different more sheltered beach. Along with the surf lessons you can also hire paddle boards and journey up the river (well recommended) . All in all Na Onda is a great surf school with great staff and should definitely be given a go!! We stayed in the red cottage. The bedroom had a queen bed and there were bunk beds for the kids in the kitchen/dining area. Bathroom had a shower, no tub. There was a sitting area right outside with a small table and chairs plus a hammock, which the kids loved. The common area was very nice, with sofas, hammocks, a dining area, and coffee station. This was about the only place to get good wifi. There is a patio right below this area with some tables and loungers, all with umbrellas. I had a Thai massage in the outdoor massage area which was very good. The boys all had a surf lesson and then rented boards and wetsuits the other days. Extremely friendly people at the surf school (Na Onda). The location with regards to the beach can't be beat. It was a 5 minute drive into town (parking can be tight, we parked in the Misericordia lot which did have a very low fee but there were always spots), or a 30 minute very nice walk on a safe well-lit sidewalk. Ericeira was very nice, better to walk around than to drive around--some of the streets are very tight! We went to the Lidl grocery store the first day and stocked our kitchen for breakfast and lunch. We went out for dinners and every meal was excellent. We ate at Tik Tak, Esplanada Furnas, Canico, and Bela Sombra, which was right on the beach boardwalk. Lots of fresh grilled fish! We also had ice cream at Blue Ice. We only took one side trip into Sintra to see the Palacio da Pena. Very beautiful but again, Sintra is not a town made for cars or buses! Last but obviously not least, we want to thank Clara for a wonderful stay. She was so helpful offering advice, making reservations for meals and activities, and just being super friendly and welcoming. The kids loved the candy jar she kept well-stocked in the common area as well as the cards and game sets. Helios was a very relaxing and friendly place to end our vacation and we would not hesitate to recommend it to anyone looking for a laid back beach getaway. The guys took a private lesson from Alvaro at Na Onda. Safety was his first concern. Everyone had a different level of experience and he was great accommodating them. He spent a lot of time with the youngest giving him tips and pushes to get up on the board, but still managed to keep an eye on the other two and give advice to them as well. It was very easy the next two days to rent a board and wetsuit for a few hours of surfing. Everyone at Na Onda was very friendly and helpful. It really couldn't have been a better experience. The accomodation was wonderful. The public areas were well maintained and homely with lovely views Clara made every effort to make everyone feel welcome and catered to special requests promptly and with great care. Cleaning in our cottage every weekday was greatly appreciated and a change of towels midweek welcome. Ericeria was a lovely town with everything you could wish for. Some great food and friendly people. We also rented a car and had wonderful trips to sintra, mafra and nearby beaches. We enjoyed very much the walk into Ericeria most days along a wide pavement and well lit. We will be back! How were the surf lessons with Ericeira Local Surf School? We book private lessons for ourselves and our son. Our instructor was a lovely man and managed to provide spearate tuition for our son who was more expert than us at his own cost I imagine. Foz de lisandro beach was an excellent beach to surf on most days. We had a couple of windy days when conditions were not great, but this did not spoil our experience. Na onda surf rental at this beach had amusing and helpful staff and competetive prices. Accommodation was simple but clean and perfectly adequate for our requirements. We loved the privacy of the villa and the views from the courtyard over the fields were beautiful. The kids loved the social area and the hammocks and we all benefitted from the jacuzzi after an afternoon of surfing. It was lovely to sit in the hot tub and ease the aching muscles whilst enjoying the views. A few more items in the kitchen would be useful. Particularly scissors. We ate out most of the time however so it wasn’t particularly a problem Clara was a great host. Very helpful and welcoming. The place is spotlessly clean, very peaceful and well thought out. We loved Ericeira. It was a good 30mins walk from the villa but that was fine. The town has an abundance of good restaurants at reasonable prices - our favourite was Prim - and the beaches were great. Very clean with good surf for beginners (which we were!). We had surf lessons at Na Onda. We booked group lessons on the first day and had private lessons as a family after that. Nelu our instructor was amazing. He gave us lots of individual feedback and really helped build the boys confidence, particularly our youngest (10) who was slightly anxious in the bigger waves. By the end of the week we were all up on our surf boards, catching waves independently and the grown ups were managing the odd green wave. Our accommodation was great and in a beautiful location with a jacuzzi looking out over the most amazing views of the valley. Clara looked after us very well, taking us shopping and even sightseeing. The communal area was very relaxing with plenty of space, hammocks, games and TV. The beach is just a few minutes walk down from the cottage and has four restaurants and the surf school and hire. The restaurants tend to be closed on Sunday and Monday evening and as we arrived late afternoon on a Sunday, Clara dropped us at a very nice sea food restaurant in Ericeira and took us shopping the following morning. The town of Ericeira is about 20 mins walk and has loads of lovely shops and restaurants. We were there for the festival of the Holy Mary and the blessing of the boats, so there was a real party atmosphere in the town decorated with what looked like Christmas lights but 'fish' themed. We got to see the boats lit up on the water taking the statue of Mary to bless the fishermen. Clara also took us to see the Palace in Mafra and the miniature village, which were both well worth a visit. We hired boards from the surf school. One day hire was not bad but if you hired for 5 days it was a great deal which included wetsuits and you could switch the boards, so we had surf, paddle and skim boards at different times. The sea is a similar temperature to England so a wetsuit is required but the river that runs onto the beach is lovely and warm and a great spot for the kids. We did not take surf lessons but hired surf boards, paddle boards and skim boards. We did the 5 day deal which worked out very cost effective and we were able to access wetsuits for the kids and a variety of boards which kept everyone happy. Absolutely perfect! One tip: we think a car is handy if you stay at Helios to get around everywhere. The accommodation was really peaceful surrounded by countryside on one side the beach on the other. Clara was wonderful and very welcoming. My kids had a great time In the river and my teenager enjoyed the surf lessons. The town of Ericeira is great and there are plenty of other beaches to go to. We just got back from Ericeira after a fantastic two week stay at Helios. Firstly, I can not praise Clara and Helios enough. The beautiful simplicity of the Helios bungalow was only bettered by the genuine attention given to us by Clara. She is a lovely person and became like family to us. We will be back to you again in the future ! I also want to pay special mention to the team at Na Onda Surf School. Alvaro and Joao run a great school there with top notch instruction. They have a great team and were genuinely interested in our little family group ... Even though it was August and they were very busy there, they always had time for a chat and a few tips ! They are decent chaps. We had a great time in both locations. We spent the first week in the Ana Margarida Villas. It was lovely and unexpectedly eccentric. The Helios Beach Houses were even better as they had fantastic access to the beach which was so good as we did not feel the need to explore further to find other ones. There is also a nice walk to the South side over the cliffs which we did on a less hot day. The surfing was good for the two older children (aged 14 and 16). The town was great, very easy to get around. We ate out only one day at O Gafanhoto’s, a small place in the town centre where the food was inexpensive and good. We visited Lisbon where the aquarium was by far the favourite of the children. Sintra which was great for its many fantastic buildings and Palacio do Monserrate which has nice gardens to visit. It was all in all a great time. The surf lessons were really fun. Of course you cannot control the waves which were not in our favor the last day but still really fun. The instructors were also great- Toby, Louis and the other guy who was really nice but cannot remember his name. Surf lessons were good for beginners, the instructors were great. Surfing was great. The water was quite rough and the classes quite big but they always had a minimum of three instructors out with us. They were all great craic too. They really wanted you to get the hang of it (i was terrible but im determined to go practice now that im home). The beaches were lovely, especially the smaller ones near to the centre. Very clean. The surf lessons were very good fun, our 2 girls really enjoyed the holidays. Davy and I had a superb surf holiday in Ericiera. Every aspect of the holiday was perfect. Clara, the hostess of Helios bungalows, picked us up at the airport (we were determined to be stress free for the trip so decided not to hire a car) and was extremely pleasant, welcoming and friendly. She immediately gave us tips on restaurants and places to visit in the area. The bungalow was clean, cosy and had a private dining area outside. A much appreciated bottle of wine was waiting for us when we arrived at our bungalow. Every evening we ate in restaurants in Ericiera village. We didn't have a single bad meal, I particularly enjoyed the fresh fish. Clara gave fantastic suggestions and even booked tables for us. The biggest memory I will take from this spot (despite the amazing surf and food) is the hospitality of the locals; our hostess, surf instructors and restaurant waiters all went above and beyond to make our stay the best it could be. We are already trying to figure out when we can go back. We are both very keen on watersports and organised daily surf lessons on Foz Do Lizandro. The coaching was far superior to any coaching we have received in Ireland, not to mention the perfect conditions. I have to say the location of the bungalows were great and Clara is a very good host. We really enjoyed the place and the hospitality. We surfed the beach the bungalow are on and a few others, was nice to visit all the other beaches. Also the village of Ericeira is so pretty that it was definitely worth it. Restaurants were really good although we did not follow Clara’s recommendations as we have a lot of friends in Lisbon , including my sister, and we came with a list of restaurant to go already. Amazing quality of food and prices. The accommodation was fantastic. It was extremely comfortable, clean and peaceful. The view was amazing. It was 3 minutes walk from the beach and 25 minutes walk from town. Clara took us into town and to the supermarket every day. She also advised us on the best places to eat and booked them for us. We are going to return next year. Surf lessons were very good. The instructors were knowledgeable and took us to appropriate locations for our skill level. The location of the house was perfect for the beach & getting to surf lessons. It was literally across the road. Felt very comfortable to let our just turned 14 year old & his mate to go ahead - felt very safe. We ate out every night sometimes in Ericeira other times at the cafés on the beach but house does have a small kitchen with fridge etc &could easily have a BBQ. Some other guests did. Beach was great, surf was great instructor was great for 2 x 14 year olds, had fun. We loved Helios. The bungalow was small and fairly basic but we loved the views across the lush valley and the proximity to the beach. We also made full use of the communal area - hammocks, loungers and the hot-tub with a view! Everywhere was very clean and well-kept. Clara couldn't do enough to help us and made us feel very welcome. Ericeria was bigger than we thought and lively with a lot of Portuguese holiday makers and locals. All the restaurants we tried were superb, especially Tik Tak and Tik Tapas and we found people very welcoming and helpful. Prices were good too - the most expensive meal we had was when we had lobster at the Ribas restaurant, but that was probably to be expected. We enjoyed the 25 minute walk back to Helios after dinner in the evening. The surf school was great and again, everyone there was very helpful and flexible. If we wanted to change the days/times of our lessons we usually could. We had pre-booked 5 lessons each but ended up having more and Tobi gave us a bit of discount. We loved Antonio and Hubert! They were very enthusiastic and appeared to take great pleasure in our progress! The beach at Foz do Lizandro was amazing and it was great having the river there too, where we went paddle boarding. Having said all that, surfing is difficult! Accommotion was really nice and cosy. Very charming and relaxed athmosphere and Clara is really contributing to this. She is such a nice person and very helpful and makes this place to a true gem. Also the town Ericeira is nice and restaurants, recommended by Clara, are excellent. Actually we most liked to hang around on Foz do Lizandro beach, the surf school and beach restaurant and surf and the fact that the accommodation is next to the beach makes this really a perfect spot. We will definitely return. Surf lessons were really good and instructors were really nice. Also for the kids lessons; the only disappointment was that our youngest (Julia - 7 years old) was not able to surf due to the wind and strong currents. Helios is a lovely place to stay. We stayed in one of the wooden bungalows which was comfortable and had everything we needed including a seating area outside. 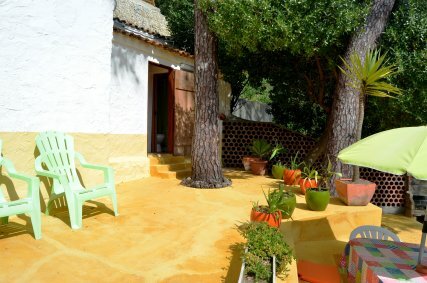 The best things about the place are the fabulous view across a lush green valley, the large communal terrace area, the proximity to the beach and, most of all, the hostess,Clara. She is so helpful and charming and always full of interesting information and chatter. She makes you feel so welcome, as if you have known her forever! Foz da Lizandro where the Helios accommodation has a beautiful beach with several beach cafes and a restaurant that is open in the evening, but no shops. For shopping and more restaurants, Clara will give you a lift into Ericeira or its a 30 minute walk away. Ericeira is a pretty town with plenty of shops and restaurants selling excellent food. Surf lessons are good. The instructors looked after us fine and were always concerned for our safety. The beach at Foz da Lizandro is beautiful but the waves are sometimes a bit strong for beginners when we were there and as it's a very popular spot there are sometimes too many people in the waves. The accommodation, the host Clara couldn't have done more! From helping me organise a surprise massage for my partner for his bday, to providing us with lots of great tips on where to go in the town. The accommodation is also stunning and it was so easy to relax from the second we arrived. We will defiantly be back! Lovely town nearby: Ericeira, not crowded, very nice people. So quiet and relaxing to stay at Helios and Clara the host is very nice. I loved the place we stayed so much, it is a couple of minutes from the beach, walking, with a beautiful view on the beach during the walk and from the entry of the house main entrance. From the houses we stayed we also have a beautiful view on the river and fields, hear birds singing and no other disturbing noises (cars etc ), just nature calm and relax! Love love love Clara, the bungalows, Ericeira, the restaurants, the people and the surf!!!! We had the best time and definitely will go back again. Clara and Paul were the best hosts and such kind people. It was great value and we can't wait to go back. The restaurants in town were great, and we even tried the all fish restaurant where u choose your own! And there was a couple of cool little bars we went too as well. Accommodation was lovely, really well looked after. It was the excellent personal service from Clara that really made it special, she even cooked us an amazing dinner one night! Plenty of things to do when not surfing, idyllic location facing quiet valley away from the traffic. The area is really lovely, town is walkable and there are some great restaurants, mainly seafood. Surf was ok, we were unlucky with the conditions - Foz de Lizandro was only surfable for anyone the first two days, then we had to travel. But the wide selection of beaches within an hour was great and Na Onda surf school were happy to provide transport. I cannot tell you what a fantastic time we had. Everything was perfect - it goes without saying that host Clara is amazing; friendly and willing to go the extra mile. You couldn't really ask for anything more. We found the whole trip worked like clockwork and we were greeted by Clara at the bus stop who took us on a tour of the village to get our bearings and made us feel at home straight away. The public bus from Lisbon was fine for us and very reasonable and reliable - 6 euros a trip. The accommodation was ideal - just what we were after. The lodge was modern and very clean. What a fantastic view over the fields and although it was quiet when we were there, the communal areas take some beating. Having wifi was really useful. Being able to walk down to the beach was great and we enjoyed having a coffee and drink at the bars down on the front as well as our surf lessons - which were superbly run and we both stood up which made our holiday. I think Ericeira as a resort has it all - a cool vibe, stunning coastline and we enjoyed heading into town for dinner on an evening using the local taxi to get home. Our stay at Helios Bungalows was thoroughly enjoyable. I would definitely recommend the place and I would come back again to stay. The bungalow was lovely and clean with a terrrace for relaxing and a BBQ area. The scenery is fantastic, ovelooking the countryside, which gives a lovely tranquil, calm atmosphere. Clara and her brother Paulo couldn't do enough for us, taking us shopping, lifts into the town in the evening and help with the BBQ! They are wonderful people, very warm and friendly. The Foz do Lizandro beach was lovely and the surf lessons were great fun, it was brilliant to have it all on the door step. Nice accommodation for a start and the chalets in Helios Bungalows were ideal. We had three teenagers with us so they stayed in one bungalow next door while we had a bungalow to ourselves. Bliss. Then there was the proprietor, Clara. Could she be any nicer? No. We had lovely chats with her, she organised massages (highly recommended, really interesting and nice Englishman who lives nearby), suggestions for where to eat, where to buy, gave us her coffee plunger, offered to get the barbeques going - anything we wanted really - and being from Lisbon she was very helpful on what to do when we took the 35 minute car drive to the Portuguese capital. Shopping heaven for teenage girls. And then the best bit. You are about two minutes walk from the sea. Up in the morning, quick breakfast (the chalets have everything you need to cook) and then down to surf. A minor (very minor) drawback is that there are no local corner stores within easy walking distance. We had a car so it was easy to nip down to the local Lidl but without a car that’s a twenty minute walk one way. But there are four restaurants on the beach all competing to serve you breakfast for a couple of Euro so you could just avoid cooking anything. It’s We walked into Ericeira a couple of times for an evening meal (easy twenty minute walk), all nice, some excellent (Clara booked a really lovely place for us down by the pier – can’t remember the name – but we wanted traditional Portuguese grilled sardines – and it was lovely and really busy, always a good sign) and all good value – five us normally fed and watered (wine and Cokes) for around €50. Having the car meant we could also head to nearby Mafra, where the Portuguese royals use to holiday and where, just outside their palace – tourist trap central - we had two glasses of wine...for €1.30. That’s 65 cent each! Not having checked on the price (and expecting to pay the normal Irish price of over €5 I gave the waitress a €50 note, causing consternation as she saw her float for the week being gobbled up). By the way, EVERYBODY in Portugal is nice. It was our first time surfing but definitely not our last. Really nice people teaching you, no pressure, gentle encouragement, and really thrilled when you actually stand up on the board (I’m not claiming we (me) all did!). an ideal family holiday in that once you’ve done a two hour lesson in the morning you’re all pretty flaked (in a lovely relaxed way) by evening time. By our third day I was asleep by 9.30. I had read reviews prior to going that suggested the water was cold. Wrong. By Irish standards the water temperature was warm. With the wet suits on two hours in the water was a doddle and not a hint of cold. I thought the lessons were excellent value for money and would strongly recommend booking for the week. Two of the girls are now ‘Little Surfers Girls’ and I know will continue surfing throughout their lives. I am sooo thankful and we were soo amazed about the place! Location was wonderful , the accommodation just lovely , very clean and beautiful. Clara treated us like family and showed us around foz and ericeria! They are such nice people, friendly and heart warmed. Surfing was super, would sure go back there next year after the baby is born! It was an unforgettable trip as we got engaged on saturday evening! We had a fantastic time in Ericeira! Carla and Paulo were brilliant hosts. They took great care of us and treated us like family. We loved the bungalows. They were so comfy and close to the beach. The common room, sun loungers and BBQ areas were great. Paulo even helped us cook a fresh lobster on our last night! Carla took us into town, shopping for groceries and was always on hand to recommend the best places to eat and answer all of our questions. We will definitely be back. A beautiful place, fantastic hosts, great surf and of course sunshine! The surf was great in Ericeira. We really enjoyed the waves and went surfing most days. It was quite difficult to book our 2 prepaid private lessons with Na Onda but we did manage to get them. We rented boards the other days and that worked out well. I could not recommend Helios Bungalows more. What a FANTASTIC place, one side the beach and the other hills and a valley two worlds in one. I have never felt so relaxed just chilling in the hammock with a ice cold beer or lying in the sun on the beds looking out over the valley. Clara makes you feel so welcome and cannot do enough for you offering lifts here and there to the supermarket and Ericeira, she is just one of life's warm people , and you must try the snails if they are on offer its a classic there i found out, Carla stewed up a pot and gave me a bowl and a beer which is also a must with snails and they were delicious. Ask her to recommend a pizza place in Ericeira i cant remember the name but it was delish as well. In all we had a week we will never forget and will be back 100%. I don't think a word has been invented to sum up Helios! Awesome! doesn't do it justice. Clara is an amazing host. She collected us from Lisbon airport and she made us feel extremely welcome from the start. Our journey to Ericeira was enjoyable as she taught us some basic Portuguese and gave us an overview of the resort. When we arrived at Helios she checked us in and then offered to take us to the local Lidl where we stocked up on shopping for our week ahead. The following morning Clara took us on a tour of Ericeira so we knew what was on offer, the lovely beaches, restaurants and the town. This was brilliant! she even stopped at the large Quicksilver shop and had a coffee while we stocked up on bargains! She also offered to drive us into Ericeira every evening at 7pm when she finished worked. We rented the 2 wooden bungalows for a week as we have an older teenage son and an adult daughter. We didn't need to as the bungalows are big enough for 4, but the extra space and privacy was great! the bungalows overlooked the river and the beautiful valley. The views in the morning with the mist were breathtaking. You get the best of both worlds, you are overlooking beautiful countryside on one side, and on the other side you can check out the surf conditions at Foz do Lizandro beach. Each bungalow had an outdoor seating area with a hammock which was perfect for that late afternoon read (or snooze which was the norm for me). The bungalows were immaculate and clean with everything you need for a self catering holiday. The communal sitting area and sunbeds were perfect for a relaxing sunbathe, or snooze if the 1 min walk to the beach seems too far. There is a hot tub and you can have a massage or join a yoga class. There are so many options at Helios to relax, perfect for the girls as the boys went on their daily surf lesson. We are planning to return next year as we have found the perfect surf destination and accommodation. Clara has become a firm friend and we can't wait to see her again! Ericeira is a charming Portuguese town that has maintained it's charm even though it is a top surf destination. We like to be away from the usual tourist spots so this was perfect! The walk back from town is about 40 minutes but along a coastal path which has breathtaking views of the famous Ericeira sunsets. The walk back is perfect for walking off the food you have consumed at one of the many top class restaurants on offer. We would recommend Tik Tak and Pedra Dura. Tik Tak has wonderful seafood on offer but also meat dishes so a good choice for a family. Pedra Dura is the best restaurant we have ever been too, a great selection and the 'Steak on a Stone' should not be missed. Very reasonably priced, we ate there 3 times and the staff have become friends too. Surfing! We have travelled to a lot of surf resorts in Europe and this is by far the best. Na Onda surf school at Foz do Lizandro beach is very good, and Clara again stepped in to make sure the surf lesson on the first day was confirmed. The lesson times were flexible based on conditions, and the lessons were at different beaches depending on the level of the students and the conditions. My son and husband are regular surfers but said their surfing improved considerably with Na Onda, and by the end of the week my son and husband had progressed to the Advanced level from Intermediate. The instructors (Alvaro, Antonio and Joao) were brilliant! Highly recommend Na Onda as a surf school. You can also hire stand up paddle boards from Na Onda surf school based at Foz do Lizandro beach and paddle up the river which runs past Helios. We did this one morning and had a great time! A photographer from Na Onda followed us along the bank taking photographs and it cost 20 euros for all the photos, bargain! This year a surf bus was introduced in the town which goes between all of the beaches every hour for about a euro, with a trailer for the surf boards. Foz do Lizandro beach has a lovely decked promenade with some great café bars to enjoy a coffee, a light bite to eat or a cheeky afternoon Mojito. Perfect! The accommodation was lovely ,simple, clean, and very relaxed , a very special place. We had a car, so made it easy to get in to Ericeira .The walk in took about 20 min and it was easy to get a taxi back . Local restaurants on beach were really good and choice in a Ericeira was fantastic. Surf lesson were okay, Instructors were really good ,beaches lovely. The biggest disappointment was size of class, just to many in class. Extra instructors (helpers) were brought in but not ideal. The Accommodation was lovely - very well located and clean. The WIFI was pretty good and access in the communal areas meant the kids were not on it all day. The main beach is literally down the hill and has a nice beach break. The town of Ericiara was really lovely - its a bit of a walk but Clara (the host) will give you a lift there with a little notice and the walk home after an excellent and well priced meal is much easier! The family took lessons which were really very professional and the school was well run. The boys loved the surf lessons. People booked a ‘card’ of five lessons and could then choose when to use them. Good in many ways because gave us the flexibility to choose the day we had no lesson and went to Lisbon, but as there were a couple of days where the surf was weak it meant lessons on the better days were a bit overcrowded. The beach is fab for surfers but also (because of river run in good for weaker swimmers and your children, Fantastic. We got on really well in Ericeira. Loved it. The Beach houses are great, loved the location, the view and the whole Helios atmosphere. Especially the lounging around area. So cosy. And Clara is brilliant, so lovely and helpful at all times. Surfing went really well too. We didn't see much of the other beaches but had a delicious pizza at Na Onda. Otherwise cooked in the bungalows. Next time we'll venture out more. I'll be in touch and am sure to be back. Thanks again so much for the reco! Our trip was great! Helios bungalows were perfect for us. The location and Clara's hospitality made for good times. There was a good deal of onshore wind, so Helios was perfect because it provided a peaceful, sunny refuge replete with coffee and reggae music lightly floating through the air. I was able to get some work done after surfing in the morning. I surfed a few hours each day and my wife ran the path along the coast. We ate a great meal at Tik Tak. Best clams we have ever had! We also enjoyed the Bamboo Bar. Tasty sandwiches and microbrews. I ended up renting a board from Nelson there because Na Onda wanted me to rent each morning but I wanted to hold onto a board so I could surf early each morning. We are thinking of returning and spending the end of our summer holiday in Ericeira. Loved the holiday so massive thank you for recommending the Helios bungalows. Clara was a brilliant host and went beyond the call of duty to ensure Emma and i had a brilliant time. Bungalow was perfect and kept clean every day. The village was lovely and the locals very friendly and helpful. Claras kindness made my holiday for me and i cant reiterate enough how fabulous the holiday was. Surf was great most days tho for me personally not my sport though waves brilliant for beginners. Emma persevered and is going to continue. We thoroughly enjoyed our surf lessons. The bungalows are in a great location, fantastic view & nicely tucked away. Clara was an exceptionally friendly & accommodating host. She gave us lifts most days and was always at hand to help out if needed. As for the surf I got the living crap beaten out of me at Ribeira, it was a big day there and I knew it wasnt for me before I "bravely" ventured out. I had some great early morning surfs in Foz:) Foz do Lizandro is the nicest beach we came across, very nice and not too busy (even when Clara thought it was really busy). We loved the town,lots of fantastic restaurants & we were lucky enough to be there for a festival. We went to Sintra which was great too. Wow, I have to say the Helios Bungalows are fantastic. You couldn't get a better location. 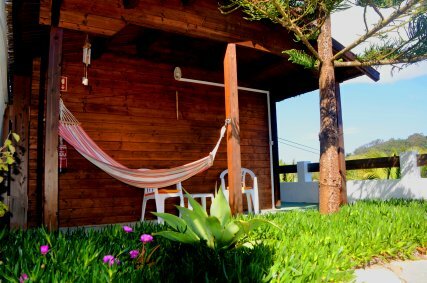 Helios is a terraced property facing Los Do Lizandro beach, literally 2 minutes stroll and you're in the surf. Our hosts Clara & Paulo were extremely generous and good craic. Clara offers a free service of one trip per day to go into town to shop or get groceries or whatever you need which is invaluable if you don't have a car. We walked into town a few evenings and watched spectacular sunsets on the way, it's less than a half hour if you're ambling along. This was our second time in Ericeira, and fourth time in Portugal, we love it. Excellent food and wine on offer, friendly people, good weather and generally good surf. We loved it and will be going back. The area was great. We found a little bar in the town called the Jukebox which is only open a few months and is great. I'd recommend it. Great chilled music and a more relaxed feeling than the other bars. The bungalows were great, although a tiny thing we had to ask for a kettle. Clara was great and found one immediately but it would have been nice to have one there. I know I'm being picky. Overall it was a great holiday and we arrived back in Dublin a bit shell shocked after such a relaxing week. The surf lessons were brilliant. We felt very looked after and safe on a couple of days when the waves were pretty big. The accommodation was fantastic, we stayed in the white villa. Great size, nicely decorated, clean and cosy. Kitchen was well equipped and private patio with a BBQ was a bonus. Ericeira, approx. 30 minutes walk from the accommodation is a small town but full of great quality restaurants and bars. Everybody will find something for them. Clara, the owner of Helios, gave us a tour on our first day and showed the recommended places. We took 4 surf lessons in Na Onda surf school. Great organisation and excellent instructors. Special thanks to Juoa (sorry if misspelled), he is just the best. Loved him!!! We had a fabulous short break in Helios bungalows in June. The weather was actually quite cool and it rained heavily on one day but that didn't spoil our holiday. The accommodation was good - I can imagine it would've even nicer if the weather was warmer but we still sat outside every evening and enjoyed the views while having breakfast. It would be really good if there was WiFi in the accommodation not just the communal area. We loved Ericeira - plenty of choice for eating and drinking. Every meal we had was good quality and really good value. This was our first visit to Portugal and we were bowled over by the friendliness of the people. Our holiday was really made by Clara our host. Her enthusiasm and knowledge of all things Portuguese was infectious and nothing was too much trouble for her. She even bought us some natas which are my favourites. We will definitely return. In fact we are already thinking about a fortnight next summer. My husband had two surf lessons. The surf wasn't great for the first lesson but the instructors were very helpful and spent time with him individually. The surf was much better for the second lesson and we got some great photos. We had a wonderful holiday in Ericeria, the accomodation was perfect, very clean with all necessary amenities including bbq with coal and utensils, its location directly opposite the beach is great. It is also very quiet and peaceful, perfect for couples, although Clara told us that she often has families too and we hope to return with our own children some day. Clara is a wonderful hostess, very helpful and friendly without being too invasive. There is a large car park with free parking opposite which was great as we had a hire car.It is about a 20 min walk into town along the seafront which is lovely. There are plenty surfing beaches within a few mins drive, a good variety to suit all levels of surfers and Clara passed on all of her local knowledge regarding all of the beaches.The town itself is lovely a small town with cobbled streets with plenty of choices of restaurants and bars, again we got lots of good tips from Clara with regard to these. I would highly recommend these bungalows. Accommodation was great! Lovely setting overlooking a stunning valley! Very chilled and felt like a retreat. Wonderful calm atmosphere- wake up to the sound of goats and chickens. Clara is the most beautiful person and an exceptional host. 2 minute walk from beach! Great surf school with very proactive instructors. Beautiful sunsets Enjoyed yoga classes and massages. Instructors were excellent- received more guidance and tuition then any other school we have been to. Banter was great! Really enjoyed surfing with NaOnda! Waves were good and fast! Beach is lovely. We thought that that our accommodation was amazing! We were right on the beach, and there was a wonderful garden with a hot tub included. The people were lovely, its was a really nice place to stay. We loved out surf lessons, especially Antonio and Hugo!! but all of them were great and very patient. Great accomodation, great surf School - loved it. Great - could not have been any better.Maybe warmer water haha! The surf over there was actually a little better for my beginner standard as the beach was less steep and gave a longer surf in the white water. Not as easy to get out back but definitely easier than most of the UK beach breaks I've experienced! The water was beautifully clean too, it literally sparkled. We liked the Bungalows very much, it is very spacious (way too spacious actually), the view is gorgeous and Clara is always available to help out. Beaches are very nice and maybe we were lucky, but they weren't crowded at all. The area also has beautiful views and a lot more to offer. And of course Portuguese restaurants are great, fresh fish and nice beer, what more do you want? :) We mostly went to Ericeira to restaurants if the word 'local' still applies then :)All in all, we really enjoyed it! Clara's attention really made a difference, she's a great host! Mauro enjoyed the surf lessons a lot and he also got some nice pictures. The weather though was changing all the time so the waves could have been better. The helios apartments are basic but clean, with nice views. The best thing is that the apartments are right next to a brilliant beach. The kids also loved the hot tub and chill out area. We loved the sushi restaurant in Ericera, the beach restarants/cafes and the guys at the surf school couldn't have been more friendly and helpful. The surf lessons were great. The instructors were really friendly and helpful and the school is really well organised. One day, when we couldn't surf as the conditions weren't right, we just took out paddle boards instead.The beach was brilliant and we loved the cafes/restaurants and especially Sunday Sushi night. Great - all was really good. So glad we hired a car though - would highly recommend this! The holiday was perfect...Clara was the best and kindest host I have known, she was brilliant and we can't praise her enough. The beach houses were gorgeous, well equipped, spotlessly clean and so cosy. Location was beautiful, very picturesque. The local restaurants were great. So as you can see all excellent feedback and I would recommend this place to anyone and more likely return ourselves! The surf was great, good and enthusiastic teachers, and good facilities. The beach was perfect for surf lessons. The accommodation was fantastic: the cabin was really cosy, the views were amazing and the whole place was so tranquil and relaxed. It's in a great location too - overlooking a quiet valley but only 2 minutes from the beach and a 20 minute stroll into town. The best thing about it though was Clara - she really looks after you and is such a great person. The surf lessons with Na Onda were very good. I was lucky that on my first day the waves were perfect for beginners, and I managed to get up on the board almost straight away. The instructor gave good feedback to help me improve, and was really encouraging. Also, as I was travelling on my own, I really appreciated the chance to buy some photos they took of me surfing, so I could prove to me friends and family back home that I managed to do it! The accommodation was great. A cosy cabin that could sleep 4. Nice to have the personal BBQ area. The accommodation at Helios was great, we went to Portugal in March and it was very quite. The town is only a 20 minute walk away along the cliff side and there are some excellent restaurants to eat at. Love the Bungalow and the area. And Clara ist so lovely- it is like going home. I will come back soon to this location. Na Onda was also awesome. We stayed in Helios in March. As in previous reviews we can confirm that the owner Clara is an amazing lady and goes out of her way to ensure that you have a fabulous holiday. We made our own way from the airport by bus and Clara collected us from the bus station and took us to our lovely little Blue house. After we got settled in, Clara took us to the local shop and had no problem in waiting on us to do our shopping. Afterwards gave us a tour of the town and showed us all the beaches and shared all her local knowledge of the area and stopped along the way for us to take pictures. The accommodation is really lovely and has everything you need for self catering holiday also has stunning views - ideal for a peaceful retreat. The town is a lovely 20 min walk from the house and Clara dropped us in on her way home in evenings. The town itself has an abundance of lovely restaurants dotted throughout the quaint town - lots of seafood. Surf - the reason we booked this holiday .. There are a lot of beaches to chose from so you will almost always be guaranteed good waves. Plenty of places to book lessons or hire gear. I found it very cold in the evenings but it was March! Overall we had an amazing few days so much so we booked or return visit before we left, roll on May.. Enough said!!! Surf lessons were great - went out two different days with the same instructor. The instructor had good English and excellent knowledge of the local beaches. He brought me to different beaches to suit my ability for the waves on the day. Overall a great experience! Bungalows were lovely. Love the wooden clean feel. We made great use of the outdoor seating and upstairs chillout place. Would have liked a toaster! The WIFI didnt stretch to our house but personally I liked no Wifi cos I liked the break from it! (You can get it upstairs if u need it) Felt like a "retreat" holiday. Clara was very nice. Couldnt have had a better host. Adored the holiday, enjoyed every moment, and would def go back to & recommend u guys! Surf lessons were excellent- intensive. So much better that when i went to Ericeira few years previously with a different surf school where they merely showed u how to get on the surf board at start then supervised. This was personal and good teachers who cared about teaching. Girls loved their surf lessons. We had a totally fantastic holiday! We just loved all aspects of it. Firstly, regarding yourselves at surfholidays- we have been delighted with your service. Website is good, and staff were very helpful and informative on the phone, and efficient in replying to email enquiries. We would definitely recommend you to friends. Regarding Helios - they were justa perfect location. Clara was delightful and made us feel very welcome. We loved her sense of family pride and passion for her home. She was happy to deal with any queries and problems on site. Our broken toilet was mended in a jiffy! The beach house was more than adequate. Our only criticism was that there needed to be more shelving/drawers, as there was not as much storage space. We loved the shared outdoor living space, and of course the hammocks are a big feature. We enjoyed a few nights in too using the BBQ area. I believe that Clara and her brother hope to add a jacuzzi, and I think this would be a lovely addition to increase the feeling of luxury. Ericeira is lovely. I know the Algarve well from 30 years ago, prior to its tourism boom. Ericeira reminded me a bit of the "old " Portugal. Abundant restaurants, all good value and not too "touristy", cobbled streets and the delightful market. We were glad to have hired a car, and ventured to many of the beaches north of the town, and to Sintra for a day trip.The local people were so friendly and welcoming to us. So we really have enjoyed our holiday, maybe one of our best family hols! the overwhelming feeling of peace and tranquillity at Helios will be my memory. The surf crew were wonderful, and the children just loved their lessons. We had only booked 4 each. The big group lessons worked well, and we all felt that we had received good individual tuition. Helios was a wonderful place for a family to stay. Beautiful view and superb access to the beach. Communal area was great for relaxing and chatting to Carla who is an ideal hostess, making you feel at home from the moment you arrive. I loved the peaceful atmosphere, kids loved the jacuzzi. Options for yoga and massage a real bonus. Yes, they were kind and fun. 1st lesson was slow to start with different levels of abilities but by day 2 the lessons were adapted. Good quality wetsuits. After discussion this was resolved amicably. Thanks especially to Hugo and Reuben - they were fab. Great spot to stay, accommodation was very simple but very comfortable and relaxing! It was all self contained with everything you need and Clara was always around to assist if you needed any advice or needed to find anything! If you want a place where you can 'get back to nature' and just enjoy the beach, get a few waves, eat well and explore the small town nearby this place is perfect! Nice accommodation. Although we expected a little bit more view from inside the house, from the living room and from the kitchen. The view is great when you step out into the seating area outside of the house. Overall we've had a nice stay. The host was sweet and the sea around the corner. Good if you're looking for silence. Ericeira is a little authentique town, quiet at the end of October. Na Onda, the teacher looked after us allright, I felt save. I would've like to learn more about the other basics of surfing, how to recognize a good wave etc. The surf at foz lizandra was big for the time we were there so they took us to fishermen's beach at the town, which was allright. The coast area and the ocean views are beautiful in this area!! Helios was a great place to stay. We stayed in the red house and it was perfect for us, liked the facilities for self-catering and in particular the BBQ. The whole set up is great, with plenty of space for everyone and to feel like you got away from it all. Clara was amazing and went out of her way to look after us. Ericeira itself is pretty and lovely for wandering around, but would recommend people hire a car if staying at Helios. We took private lessons with Na Onda and had Alvaro who was excellent (and only mild-moderately despairing at our ineptitude). Everyone was really friendly and helpful and we would wholeheartedly recommend them. The beaches are great for beginners and those looking to improve their technique. The accommodation was absolutely amazing. Set in an idyllic scenery spot which was so quiet and relaxing which was exactly what we wanted. The house (white house) itself was so cool and had everything we needed. The town itself is great with lots of restaurants and little bars with pedro dura a standout with its steak on the stone! There is also a great little coffee shop near the wall that overlooks the pier that serves tasty coffee and homemade food. The surf lessons were great! Best waves I've ever ridden. The instructor was so helpful and great fun as well. This was the second time I'd stayed at Helios and this time I brought the family! Clara was the perfect hostess and friend as always. We love the setting of the bungalows with the lovely views and the location to the beach. The town is a nice cliff top walk or just a €5 taxi ride away. Another great stay at Helios and looking forward to the next!! We didn't this time but have in the past and the guys are great and very helpful. Place is so lovely. But the best part of our stay was Clara. She treats you as family and is that rare individual that genuinely loves people. The location is perfect if you are surfing at Foz do Lizandro. It's across the street and plenty of parking in the beach parking lot. If you are car less it's a bit of a trek into town.. but in the warmer months is probably quite nice. Hope I can get back to this spot one day, truly a special place. No Onda is awesome!! We had a blast surfing with them!! They are super flexible with making accommodations for all levels as well. I took private lessons and it was good. Excellent host. Cabins are clean and we'll equipped. Beaches are stunning, would go again. Great accommodation, nice and chilled. Great communal area. I didn't take surf lessons myself, but one of our group members did & was happy out. 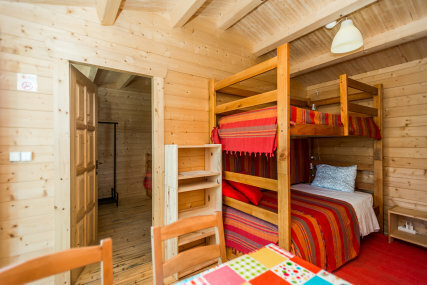 1 Bedroom that can be made as a Double, Twin or 2 Bunkbeds. Living room with double sofa bed or bunkbeds. Windows overlooking the beautiful valley below. In a private area away from the common area. The waves need to break in shallow water, to be ridable. Before going out there and start catching the first waves is important to tell the difference between the three main breaks. Beach breaks is the best type of wave to start surfing on. Beach Breaks form when the sandy seabed gets progressively shallower, more precisely when the height of wave reaches a depth of roughly half of its height. So a beach break can be woefully unreliable in terms of where it will break and how big it will be and how deep. This means that most beaches are by default beach breaks. The disadvantage of beach breaks is that the waves are often not quite as big as with other breaks and they can break less predictably, which means that it is more difficult to surf on the edge of the wave. The advantage is that they are less risky, though one should still watch out for sea currents. Before getting in you should observe other surfers and understand where the best place is to catch the wave. Best time to go depends on your level above. July, August & September are the peak tourist months. This is where you surf Europe's best coast line and let the fun begin.There are over 12 surf breaks along the Ericeira coast, with different options for all standards. With so much choice you'll feel like a kid in a sweet shop! The area was introduced in the Stormriders Surf Guide to Europe with the heading "Enter the Heartland". In 2011 it was awarded the title of 'World Surf Reserve', there are only 2 other places in the world that share the title: Santa Cruz, US and Manly, Australia. If it is your first surfing holiday to Ericeira then head straight to Foz do Lizandro and Sao Juliao beaches south of town, they are perfect beginner and intermediate surf spots. Closer to town is Praia do Sul. Another great beginner beach breaks. All best at mid tide but surfable at high and low tide also. For Intermediates you have the reliable and safe reef break Ribeira d'Ilhas, which host the WSL World qualifying series surf championships every year. And for the more adventurous you have the world class Coxos. That's just naming a few, there are too many surf breaks to mention here! Don't forget to explore further up the coast - 25 minutes away is Santa Cruz and an hour away is Peniche, home to the World renowned Supertubos and host of the Rip Curl Pro since 2009. 30 minutes south of Lisbon is the Cascais coast with the famous Praia do Guincho surf beach. And when north winds are blowing you can venture further south towards Carcevelos beach and the other surf spots along the Lisbon coast. Your balance is due to the property 30 days before arrival. The Property will contact you to collect payment. If you book within this 30 days then the property will contact you shortly after you book to collect the balance. You can cancel anytime up to 30 days before travelling and you will be refunded the balance. discovered Ericeira in the 70’s during childhood when our dad rented the original property. Years later our dad bought the property and nowadays a part of the area is dedicated to host and entertain our guests.